CHARITON, Iowa (CNS) — The ancient Catholic tradition of Ember days has been resurrected in the Diocese of Des Moines by a deacon who serves in rural ministry. Deacon Eric Bertrand, assigned to Sacred Heart Parish in Chariton and Holy Trinity Parish in Lacona, said he was inspired to reintroduce the prayer and fasting traditions of Ember days while reading Pope Francis’ 2013 apostolic exhortation, “Evangelii Gaudium” (“The Joy of the Gospel”). 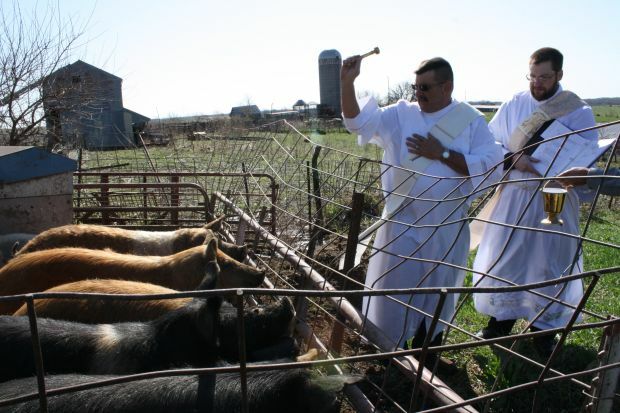 As a result, priests and deacons will by request make home visits to farmers who would like their seed, livestock, water sources, equipment, tools and land blessed. Farmers are encouraged to contact their local parish. Kyle Lechtenberg, director of the diocesan Office for Worship, said the Ember day tradition focuses on giving thanks while remembering our dependence on God. In 1966, Pope Paul VI’s apostolic constitution, “Paenitemini,” addressed and altered fasting guidelines and excluded Ember days as days of fast and abstinence. Ember days occur four times per year, loosely corresponding to each season and preceding a liturgical feast day: Ash Wednesday in spring, Pentecost in summer, Exhaltation of the Holy Cross in fall and St. Lucy Day in winter. Deacon Bertrand wants to bring back the message of Ember days while incorporating the spirituality and reverence surrounding agriculture. Deacon Bertrand said he would eventually like to have a special day of prayer and blessing for the public in the fall. City dwellers would benefit as well, he said. While giving thanks, it’s also important to remember farmers who have been injured or killed, as well as immigrants traveling far and working long hours in the fields to provide for their families, he said. Ralph Sheve, a farmer and parishioner of Sacred Heart, looks forward to having his farm, equipment and cow/calf operation blessed. He likes the idea of renewing old church traditions and feels it can only help him spiritually. “I just feel like in this day and age, the devil is working harder and harder to get my soul, and so anything I can do I’m going to do it,” Sheve said. Farming can also be a dangerous occupation, and Sheve is thankful he has not faced serious injury or death in his family. Collins is a multimedia journalist on the staff of The Catholic Mirror, newspaper of the Diocese of Des Moines.